"We all know that history repeats itself, but we will do everything in our power to try and prevent [Ferrari] from winning the title for the next 21 years." When McLaren boss Ron Dennis uttered those words at the end of the 2000 season, Ferrari had just ended their longest ever spell without winning a Drivers' World Championship. It came courtesy of Germany's Michael Schumacher, who won the coveted title more than two decades after South African Jody Scheckter got the last one for the Prancing Horse in 1979. But while Ron Dennis knew, as well as anyone, that another 21-year drought for the Italian team was little more than a faint hope for the Scuderia's rivals, no one could have predicted then that Ferrari wouldn't have lost a single World Championship since. The last six years have seen the Maranello-based team winning five Drivers' Championships, all at the hands of their star driver Schumacher, and a staggering six Constructors' Championships, thanks to his combination with Brazilian teammate Rubens Barrichello. However, while it's the names of the two race drivers filling the record books, there are two more Ferrari drivers who tirelessly work behind the scenes, crunching through the kilometres far away from the world stage: Italian Luca Badoer and Spaniard Marc Gene, the latter having just joined the former this winter in the role of test driver for the historic marque. 34-year old Badoer is a true veteran in testing: he joined Ferrari as test driver in 1998, having already raced in some 35 Grands Prix for small teams like Lola, Minardi and Forti. The next season he raced again for Minardi while fulfilling his testing role at Ferrari at the same time. During his tenure at Ferrari Badoer has never been able to be the first driver to test a new car: Schumacher has always taken precedence. This year, however, it's different. 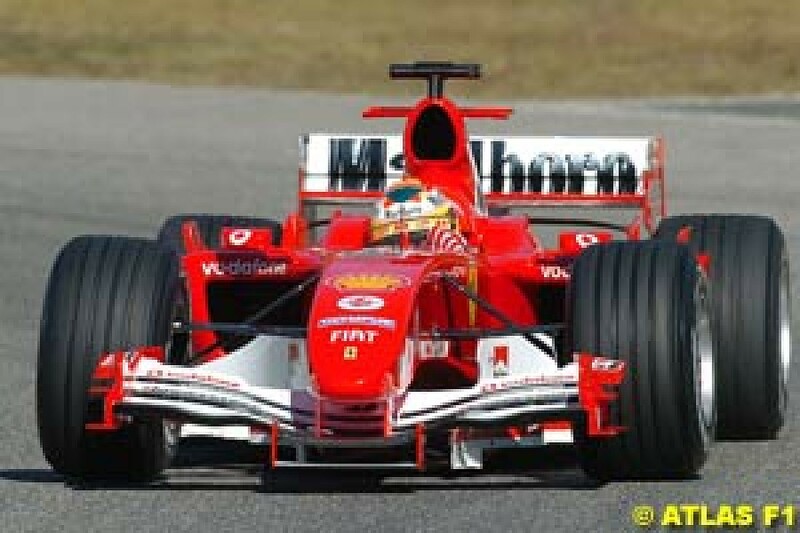 The Italian team presented their new car, the F2005, just nine days before the first Grand Prix of the season, and since this is held in Melbourne, Australia, the race drivers left for the antipodes right after the launch. Speaking at the unveiling of the new car in Maranello, Badoer explained his feelings about this new experience. Q: "Luca, this year you will have the honour and the responsibility of weaning the new car. What does it mean to you?" Luca Badoer: "The only reason for it is that Michael can't do it, because he leaves for Australia tonight. In any case it's something that fills me with great pride. To be able to do the first steps on the new Ferrari is something that excites me a lot, so I'm very happy about it. What I really hope for, however, is that it's fast, and that the first impressions I will have will be positive. This is my main concern, more than the fact that it'll be me doing the first laps on it." Q: What are your expectations of the F2005, from what you've seen already of the car? Badoer: "We are expecting the car to be faster, as we have some data with which we already know it's going to be faster. You know, we gained some tenths on the aerodynamics, some tenths on the weight distribution and some tenths on the better rigidity of the car. Only when we test it will we know exactly the situation, so when we'll put all this together we'll know how much faster it is than the old car. "I think [the improvement] over the car that we will use in Australia will be substantial, but as you know everything is possible, so we will test it and I will tell you in some weeks time." The Scuderia's have decided to delay the introduction of the new car until after the first few Grands Prix of the season in order to make it as competitive and reliable as possible. This is in accordance with the new regulations, which impose restrictions on aerodynamics, and engines, which must last over two Grand Prix weekends. The car that will start the season in Australia is a modified version of the F2004, the car which won 15 out of 18 races last season. Badoer was supposed to debut the F2005 at Ferrari's private circuit of Fiorano last Monday, but since the snow and ice on track made this impossible the car got its first run the day after at Ferrari's other circuit in Mugello, just 70 miles south of Maranello. After the day's work, the Italian driver's comments were encouraging: "This morning there was obviously some tension, which quickly lifted, going out on the track and seeing that everything is fine. After these initial laps, I can say that we are satisfied." In the meantime, his new colleague Marc Gene is still acclimatizing in the new team. Gene debuted in Formula One as Badoer's teammate at Minardi in 1999, where he stayed for one more year. At the end of 2000 he signed as test driver for Williams, filling the role at the Grove-based team until last year, having also raced in three Grands Prix when Germany's Ralf Schumacher, brother of new teammate Michael, was sidelined after suffering a major injury. Q: Marc, how do you feel at Ferrari? Marc Gene: "The team has done everything to make me feel well and to give me as much information as possible. The fact that I had already worked for an Italian team in the past makes my job easier. For the moment I'm surprised and satisfied by how united this team is, and how all the components and people work - the team is really very strong in this sense." While Badoer started putting the first kilometres into the new car, Gene will have to wait a while longer. In the words of Technical Director Ross Brawn, the Spaniard "is going to concentrate on tyre work for the next few weeks." Q: Ross Brawn said that initially you'd be doing some tyre testing. When do you hope you'll be testing the new car? Gene: "I don't know, honestly. My first test will be in the week after Australia. I don't know if I'll use a hybrid car or a new one, because things are changing and it isn't all clear. I'd say perhaps after Malaysia - it would be more probable, I think." Even though Gene will have to wait before driving the new Ferrari challenger, he's already tested last year's F2004 extensively. Q: Marc, could you compare last year's Williams car to the World Championship-winning F2004? 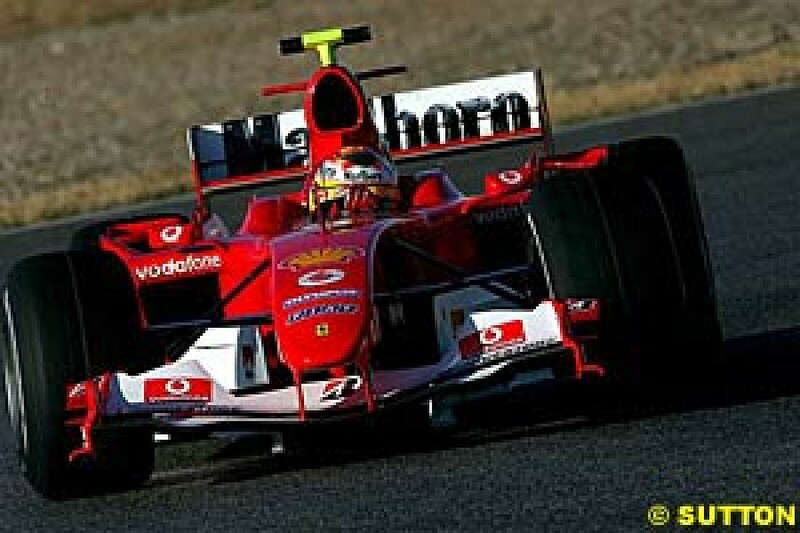 How much do you think the car contributed to Ferrari's success in 2004? Gene: "It's a bit of everything. The reasons why Ferrari were so dominating last year are many: the tyres factor, the drivers factor, strategies. It's clear that the Ferrari was the best car of the season - it wasn't the best in some small areas, but it was very reliable. As you've seen, it almost didn't suffer any troubles, which is very important. The tyres were also very consistent, even though recently the Michelins have greatly improved on this aspect. The power was sufficient and with the aerodynamics and electronics it was also very strong. "So it's small areas were the Ferrari is stronger than the other teams. This is what Ross Brawn says too: that Ferrari tries every year to improve on the small aspects. It's not about trying to make one thing much better than anyone else: in my opinion it's many little things being better compared to my previous team's." Q: Since you are comparing, how much better is this Schumacher compared to the other one? Gene: "I don't know because I haven't yet been able to run on the same day with Michael. But I won't deny it, in my opinion Schumacher is a driver who wins races in the car, but even more outside the car: that's where he makes the difference. He works harder than the others, he's more professional than them, he puts more effort in. In my opinion that's where he makes the difference to all the others." With the new regulations restricting the cars' aerodynamics, the level of downforce has been considerably reduced. Coupled with a new rule limiting the drivers to use only one set of tyres for both qualifying and the race - thus forcing tyre makers to produce harder, longer-lasting tyres - the cars are said to have become more difficult to drive. Q: Has your testing role become more tiresome with the new regulations? Badoer: "I wouldn't say more tiresome. In the last few years our role has become more and more important, so if we judge over the span of the year it has become more tiresome because last year I did many laps, but if we judge it by comparing last year's car to this year's it's more or less the same: there is less downforce, but in the end at one second slower [per lap] you can't say the car is easier to drive, so overall the level remains very demanding." 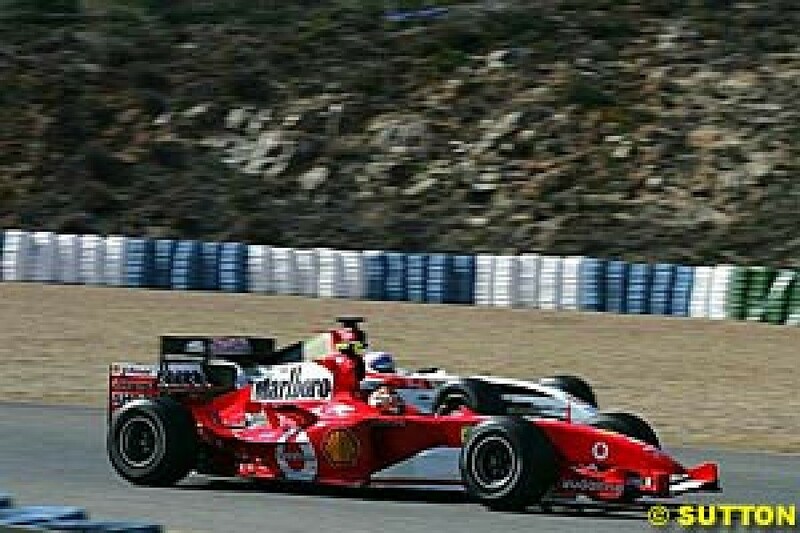 Q: With the new regulations causing a decrease of aerodynamic efficiency, what were your impressions of testing the modified 2004 cars, and what do you expect from the 2005 cars, considering that in the latest tests lap times have dropped close to last year's pole positions and lap records? Gene: "I'm surprised that [Renault driver Fernando] Alonso managed to get a 1:13.9 [at Barcelona on February 18th]. I think no one expected that, neither the FIA nor any team. I'd say it's slightly worrying because all these changes [in the regulations] were made especially with the intention to reduce speeds. Up to now speed was over one lap, but now you do many laps on the 1:14s. The cars are now more physical to drive than in the past, because in the past you'd do these lap times in qualifying, while now you do them in the last stints. So there should be this 20% reduction in downforce, but there are some teams that seem like they've actually gained some, so I'm really surprised, like everyone." Badoer: "I'm not that surprised, because we've seen that season after season F1 gets faster: more of less every year we'd get faster by one second. So we've lost one - one and a half seconds at the start [through the regulations], but we'll do the lap times from last year. If they didn't change the regulations it's likely that in Barcelona we wouldn't lap in 1:13.9 but in 1:12.5. So I didn't expect it this fast, but I was sure that during the season we would get down to last year's lap times." Q: Question to both: from what we read in the papers, it looks like drivers need to change their driving styles to suit the new tyres. Is this true? Also during GP simulations can you drive like last year, with very quick stints, or do you need to preserve the tyres? Badoer: "It depends on whether you have tyres with which you're sure you'll get to the end of the race. In that case nothing will change and the driver will have to push from the first to the last lap. If on the other hand you know the tyres will work up to ten laps from the end of the race, then you will have to run a race in which you'll need to preserve your tyres. It's all down to the tests we've done and to the evaluations we'll do for every circuit. "Regarding the driving style there's no change. Every driver has his own driving style and in the end it's difficult for him to change it depending on the car or the tyres. In my opinion it's the opposite: you want a car and tyres that are suited to your driving style. The only thing that will change is the way you run your race, which will depend on how long you expect your tyres to last." Gene: "It's clear that it's easier running a race when you have some margin than when you are behind someone else. There are drivers who have a more aggressive style than others, but thinking about the way you run your race while you're always on the limit is difficult. It can be done, but in my opinion it's difficult, especially if you don't have a big lead. "In my case, because we're driving with less downforce, I try not to be too aggressive in the braking, because otherwise you lock up quite easily, especially in turns where you don't have much speed. When you brake at 300 km/h you have lots of downforce, but when you do it at 200 km/h you don't. So it hasn't changed much, but sometimes I need to think about not being too aggressive on the brakes, because sometimes you lose more time than you think you are gaining." Q: Have you tested the final specification of the Bridgestone tyres? If you have, could you tell us about it? Badoer: "You know, at the last test in Valencia there were Michael and Rubens. It was a very important test for the [tyre] construction and for the compound. It was the last test before the race, so it gave a big indication on the choice of tyres for Australia, but the choice doesn't depend just on that test. I was working in Barcelona also in view of the first race, so it's not just about Valencia. However I think the final choice hasn't been made yet." Gene: "As far as I'm aware, I don't think that I have tried the final tyre spec. I've just driven at different moments, different specs I'd say. And then it was difficult to test even in Barcelona or Valencia because of the temperature conditions, which were very different to Australia. So I wonder really if the tyres they used in Valencia will be the ones going to Australia. Maybe the Australian ones will be slightly modified for the difference in temperature they will find there." Q: Question to you both: last year in Formula One there were many incidents, due in large part to structural breakages. How will the new regulations help avoiding these incidents, keeping in mind that the first impressions on the 2005 cars are, according to various quotes, more dangerous to drive? Gene: "I don't think there are problems on the structures of wings or suspensions, because you can still change these components like you could last year, so I don't think it's more or less dangerous in that sense. The only parts we'll change less often are the tyres, but the tyres manufactures are calm about it: they don't think we'll have problems, even though last year we had some. I think that we'll have the same structural situation as last year with the cars. Theoretically there should be more problems with the tyres, but apparently the manufacturers aren't worried about it. Whether a compound will reach the end of the race or not is another story, but structural [tyre] problems I think have been solved." Badoer: "Yes, I agree with Marc." 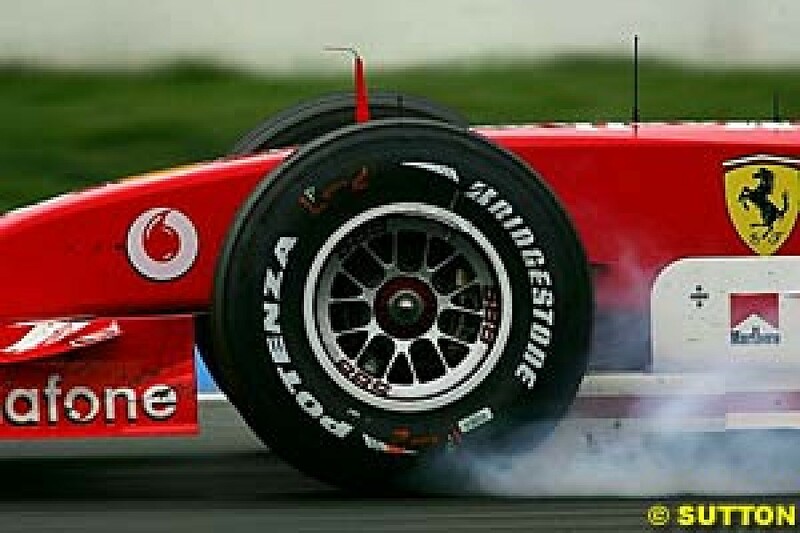 At the launch of the F2005, Ross Brawn predicted that the new regulations will bring "a lot more overtaking during the races," because he believes the cars will be slower than last year when rejoining the race after a fuel stop, as they won't be carrying a fresh set of tyres. But Badoer doesn't seem to agree with him. Q: Will there really be more overtaking like everybody hopes? Badoer: "I don't think anything will change. In fact I think we'll see even wider gaps, but this is my impression. After all, besides some exceptions, we've never really seen any overtaking in F1, so it's a bit of a pipe dream to see overtaking and spectacle. Formula One is a different kind of spectacle: it's more refined, and should be seen under a different light, perhaps with more information on TV, more communication on the lap times, the strategy and this sort of stuff, because a race seen from the inside, with knowledge of the strategy, becomes very interesting and a different kind of spectacle. But I honestly don't think that from an overtaking and spectacle point of view it will change much." Since the beginning of last year, the teams that didn't get a top four placing in the Constructors' Championship on the previous season have had the possibility of fielding a third car on Friday practice at Grand Prix weekends. The third car could do unlimited mileage, since it wouldn't suffer penalties for engine failures, and this has enabled those teams to gain precious information, helping them choosing the best tyres and the right set up for the racecars. BAR's third driver Anthony Davidson shone last year, often ending up fastest on Friday practice sessions. While BAR finished last season in a remarkable second place, McLaren had their worst season in decades and ended up fifth, thus gaining the right of fielding a third car on Fridays this year. Q: Question to both: the job you do is always far from the public. When you see what happens with other test drivers, like Davidson last year, don't you feel a bit of envy, don't you miss this aspect of putting up a show? Gene: "No, it's clear that last year it was Davidson while this year it will be the McLaren test driver, because you'll see that this year, with the new regulations, the engines on Fridays will be at very low regimes and tyres will get little running, so it will be normal that the [test] drivers in the top teams will be fastest, but every team knows that. So, for the people who don't know much about Formula One, it's surprising that a tester is in front of all the top drivers, while the people in Formula One have more information, so they know that he is a fine driver but the lap times are partly due to the fact that he has unlimited set of tyres and unlimited engine RPMs. I prefer anyway being in a top team from last season [with no chance to run on GP Fridays] than being in a team that was in 5th or 6th position and having more success on GP weekends." Badoer: "I'm also fully satisfied and happy with the role I have here at Ferrari. Of course my dream would be to race in a Grand Prix... if God permits, maybe one day I'll be able to make this dream come true, otherwise I'm happy anyway." Badoer hasn't raced since the end of 1999, with Minardi. 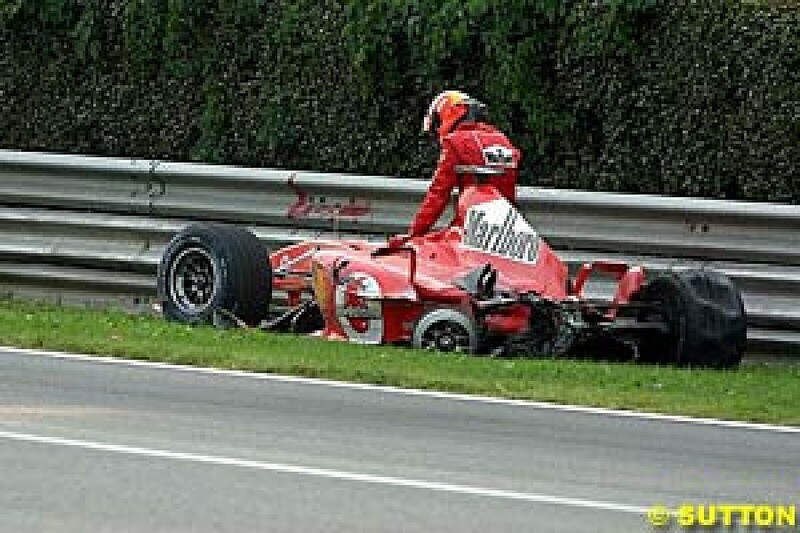 When Michael Schumacher broke his leg at the British Grand Prix of the same year, Ferrari called Finnish driver Mika Salo to substitute for the German for six races. 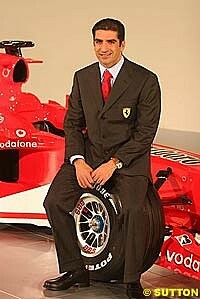 Badoer, also fulfilling the role of test driver for the Scuderia's then, must have been gutted. Since then, no Ferrari race driver has missed a race, so Badoer is still waiting for his dream to come true. Q: Luca, you said your dream would be to run a GP. Is this exclusively with Ferrari? Have you had offers from other teams? Which ones? Badoer: "I receive offers more or less every year, but I've already had experiences of driving for small teams and I didn't like it. So, if it has to turn into a reality it's going to be with Ferrari, because with other teams it's not a dream."